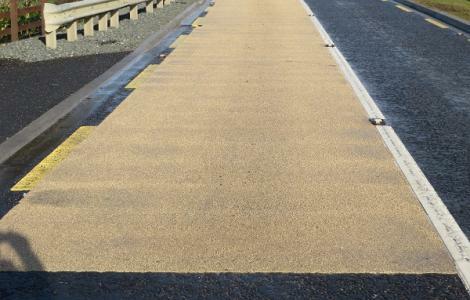 We offer a range of hot and cold applied high friction road surfacing products that actively reduce braking distances and decrease the likelihood of vehicles skidding. Developed to assist road users to reduce braking distance and to improve safety where it is needed. Our hot applied systems are quick to install all year round and roads can be opened up to traffic within 20 minutes of completion. PROCALM & PROTRACK – Coloured surfacing for light/medium trafficked sites, such as cycle tracks, pedestrian crossings, speed roundels and village gateways. ROCBINDA our cold applied system is a versatile and highly durable traffic safety solution for use on any type of road. ROCBINDA is suitable for heavy trafficked areas and is available in a variety of colours. This is a high performance premium product delivering outstanding grip to traffic. BBA HAPAS Type 1 certified. Application season is restricted for this product.